Strokes are the third leading cause of death in the United States with a person dying every four minutes. Strokes happen at any age, but the risk of having one doubles each decade after the age of 55. Additionally 53% of stroke survivors may end up permanently disabled. Active neurons, brain cells, require a constant flow of oxygen and nutrients which are supplied by blood vessels. A mere 60 second interruption of blood flow may result in the death of two million brain cells. Such events probably account for the significant number of disabilities experienced by stroke victims. What Exactly is a Stroke? 87% of all strokes occur when blood flow is blocked by a blood clot in an artery in the brain. This type of “brain attack” is termed an ischemic stroke and if blood flow is not restored quickly enough may lead to significant damage or death of brain cells. A second type of stroke, the hemorrhagic stroke, results from the rupture or leakage of weakened blood vessels in the brain. Blood spills into and around the brain triggering significant inflammatory and other immune responses as the body tries to “clean up” the blood. Even though only 15% of all strokes are hemorrhagic, they are responsible for about 40% of all stroke fatalities. Identify a Stroke and Save a Life. 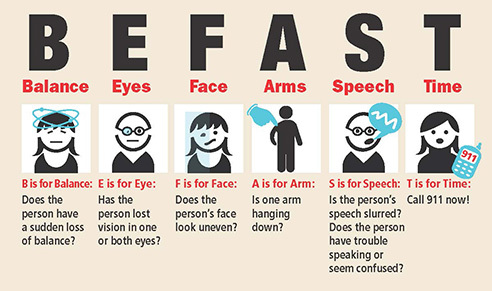 Identifying quickly whether a person is having a stroke can save their life or prevent them from a lifetime of disabilities. Stroke is largely treatable – but time matters. Every second counts in getting help. The faster people are treated, the more likely they are to recover without permanent disability. BALANCE: Is the person experiencing a loss of balance? EYES: Has the person lost full or partial vision in one or both eyes? Is their vision blurry or double? ARMS: Have the person raise both arms up — does one arm drift downward? Are they experiencing weakness in one or both arms? SPEECH: Is the person’s speech slurred or having difficulty finding words? Can they repeat a simple phrase without sounding slurred or strange? TIME: Time is of the essence! Getting help fast is key to preventing brain loss or death. If they have any of these symptoms, call 911 immediately, even if the symptoms disappear. The faster a stroke victim gets to the hospital, the better the chance of a successful recovery without life-limiting or even fatal results. When stroke occurs, the nerve cells in the affected part of the brain die and immune cells rush into the area to clean up the dead cells. This inflammatory response is essential to forming new nerve cells and for repair and healing, but uncontrolled inflammation can lead to further damage to the brain. As is always the case, immune homeostasis, the right balance of inflammatory responses, is needed for a rapid and complete recovery. Through the years, many whom I have advised to balance their immunological responses, have recovered at a significant level after their stroke. Of course, their recoveries may have been coincidental to immune re-balancing, but it certainly is prudent to strive for immune homeostasis, immune balance, when healing. Dr. Hellen is available at 302.265.3870 (EST, USA) for discussions as to the role of immune homeostasis for optimum health. There is no charge for the first 30 minutes of the consult. She may be contacted at: drhellen@drhellengreenblatt.info, or use the contact form.